Have you visited the stunning Hodsock Priory Snowdrops yet this year? It’s a splendid way to take a beautiful walk and why not treat yourself to a delicious hot drink in the Tea Room afterwards? There are only two more weekends to see the snowdrops in all their glory. If you like European crafts, food and drink then you must visit Worksop this Saturday for the final day of the wonderful Continental Market. And, of course, there are the normal Saturday markets in Worksop and Retford. For the more energetic there’s the regular Saturday morning Clumber Park Run and a very exciting one-off Rother Valley Duathlon 2016 on Saturday which promises to be a great spectator event to see all the entrants taking on a run, cycle, and another run! Perhaps you've booked to go to the fascinating Archaeology Workshop about the Vikings of Sherwood at Sherwood Pines Forest Park, Kings Clipstone near Mansfield or are you taking the interesting Winter Tree ID Walk through Sherwood Forest Saturday morning? If spending time inside is more appealing then there's a new art new art exhibition at Bassetlaw museum featuring the paintings of local artist Julie Baugh. Perhaps you’d like to improve your Photo skills? 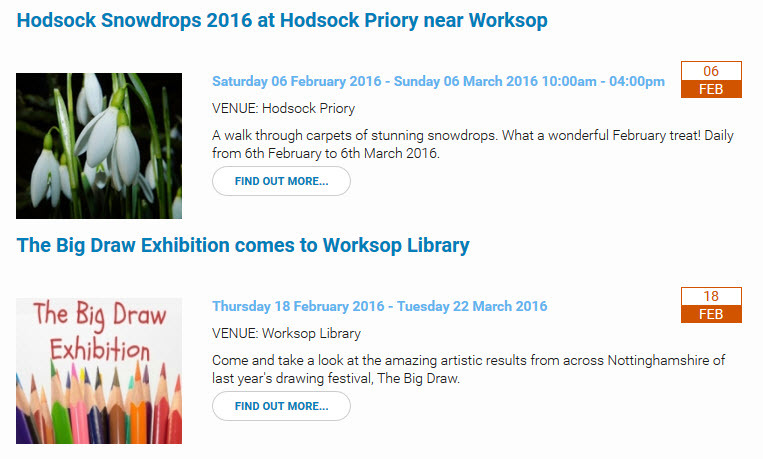 In that case don’t miss the excellent Photo Workshop at Retford Library on Saturday. For music lovers there is the Simon and Garfunkel Revival Band at the Retford Majestic Theatre on Saturday evening and if you enjoy delicious food why not try Deli & Dine’s Spanish Spectacular evening on Saturday in Retford. If you fancy an early start on Sunday and a bit of shopping before lunch there’s the regular weekly Sunday Car Boot Sale at Oldcotes near Worksop. There is plenty for children and the family to do this weekend too. How about visiting the Big Draw Exhibition in Worksop Library where you can see the fantastic results of last year’s actual Big Draw Event. Perhaps you can spot your own or your children’s creations amongst them? There’s a treat for children on Saturday and Sunday morning at the Savoy Cinema where Kids Club is showing the film Pan. Bircotes library hold a regular Saturday Kids Fun Zone morning for children over three. If you’re a Dad in Sutton-in-Ashfield you’ll certainly win loads of brownie points if you take your children to the Library for a special Mother’s Day Card Making session! Finally, if you or your children would like to spend creative time at home there's always the fabulous North Nottinghamshire short story competition to enter! Whatever you get up to, have a great weekend!